ProSiebenSat.1 Sustainability Report - nexxar lab. 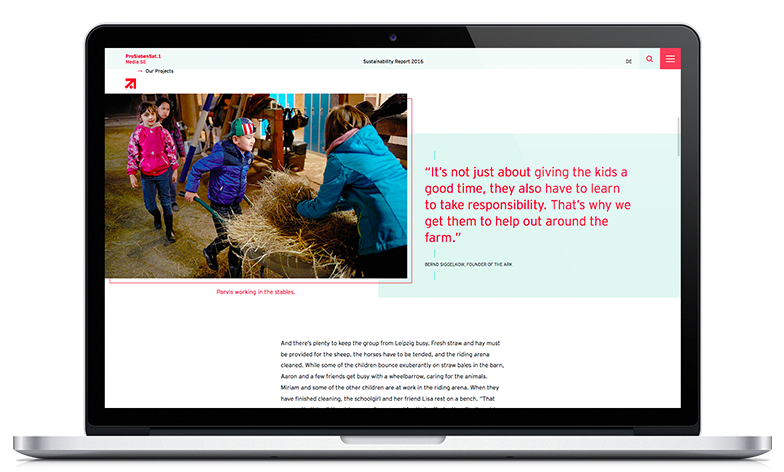 Online report & print brochure: an example of ProSiebenSat.1. The ProSiebenSat.1 Sustainability Report 2016 as a whole was published as online version only, accompanied by an additional print brochure containing the most important facts and stories. Picking up on the topics of the previously published Public Value Report 2015/2016, the brochure serves as content-related update focusing on the 2016 sustainability activities around the company’s five areas of action. The print brochure does not cover the full Sustainability Report but offers a solid overview thereof, consisting of excerpts on all major sustainability topics and four stories on the company’s public value activities. To differentiate the fact-based report from the magazine content, the design was adapted respectively. While the fact-based report content follows a very slim, white design, the story pages are enriched with images and additional information boxes in the color petrol to catch the reader’s eye. Both online report and brochure follow the same clean design, however, each was adapted to follow own rules to fulfill the respective format’s needs and exploit their full potential. Throughout the whole report, the design picks up on the two main colors of ProSiebenSat.1. While petrol is used as background color to highlight different content or service sections, such as quotes or graphics, red is mainly used for text elements, either in terms of emphasis (e.g. key figures) or as a point of guidance with respect to the recognition of different elements (e.g. headlines, links or captions). At the same time, the design leaves room to breathe. The elements do not take up too much space, neither on the screen nor in the brochure. In this way, the structure of the content stays clear and any feeling of information overload can be avoided. The five areas of action of ProSiebenSat.1 are a result of the company’s Materiality Assessment. By designing an icon for each area, key visuals underlining the priority of these material topics were created. The icons are used in the brochure as well as the online report, functioning as another essential point of orientation for the reader. Animations are an excellent online-specific mean to empower the design. 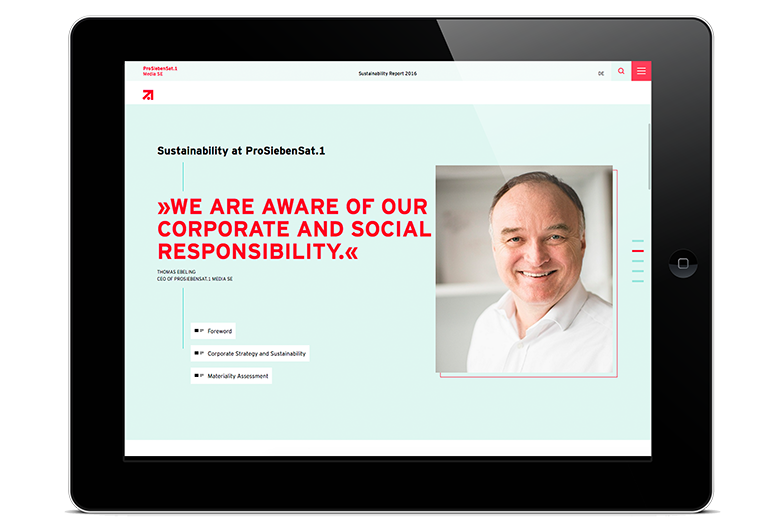 The newly created homepage of the ProSiebenSat.1 Sustainability Report 2016 is divided into different sections, each of which provides the user with several options to enter the report content, using a few different types of animations. Next to a numbers count and mouse-over animations to emphasize links going into the report content, a petrol line connecting all sections follows the scrolling behavior of the user. Apart from that, the line element guides the user through the whole online report, recurring at different points.